What a shame that what could be a great hotel is spoiled for the want of a little more attention to detail. We arrived 2 days after the hotel opened for the new season and it seemed to be run on a skeleton staff.As a result there were numerous problems in the dining room with buffet trays being empty and not being replaced for ages,no tea bags,no milk,no hot water etc.The food was not up to standard for this class of hotel,most of the veg seemed to be from catering tins and the meat and fish were of poor standard and not always well cooked.Very often,even soon after the buffet opened,food was cold,or at best lukewarm.At first we put this down to teething problems,but during our 11 day stay,if anything,it got worse to the point that we were struggling to put together a palatable meal. Whilst we were there the evening entertainment was held in the 30 seat Calypso Disco Bar as the management didn't think it was warm enough to hold it in the outdoor theatre despite the fact that we sat out in short sleeves until gone midnight. On the plus side,this hotel is set in magnificent grounds,and these and the hotel are kept spotless,the pool area is well kept and substantial.The 3 small beaches are not really very good,the sand is gritty and there isn't much of it.Don't bother paying extra for a "beach front bungalow"-they like the hotel are on top of a steep slope,a good walk down to the beach,and a lot of the "bungalows" are 2 storey.The hotel is a bit remote(a 40 minute bus ride from Rethmynon and 1 hour walk to Panormo,which is a very small village that can also be reached by bus or tourist train. )All in all a bit of a disappointment. Hotel. Modern, set in c. 200 acres well laid-out and maintained gardens, 5 pools and 2 beach cove pools. Separate buildings for theatre, animation, discos, shop, Zorba's pool snack bar. Bungalows in grounds if preferred to main hotel. Excellent and extensive range and selection of food and drink in main restaurant and bar. Restaurant and bar have outside terraces (we didn't eat inside during the fortnight).Water Sports centre. Wonderful views of sea and mountains. 1. The tiled area around the pools is like glass and when wet it was lethal. Everyine was slipping and the only way to stay relatively safe was to buy acqua shoes from the shop. (I bet they do a good trade) One woman broke her leg and a young girl cracked her elbow just in the week we were there. Be very careful. 2. The food although plentiful I found to be far too salty for my taste. Even the pitta bread was covered in salt. 3. The 'beach' area is man made and therefore has no tidal movement. The area where there are a few sunbeds is on very grey sand and not very inviting. The staff were very nice, the hotel was spotless and towels were changed every day. Our rooms very nice with sea view, although one of our three families were located in a bungalow on other side of hotel (meant to have sea view but never did). Mini bar provided but whatever you used this was not replaced, so ran out after couple of days. Hotel food very german orientated but good choice. Disappointed that you had to get your own drinks rather than be served them at your table (never experienced this before in a 4* hotel) Red and white wine awful, fruit juice seemed watered down aswell. Hotel staff in restaurant very polite. Entertainment was extremely basic. Hotel of this star rating surely could have some good acts in but all entertainment by staff. Not much to do in evening, went to small town nearby but not really worth the effort. Six pools, all salt water and snacks very limited around some of them (main pool ok - but noisy and busy). Only snacks were made up rolls wrapped in cling film stuffed in fridge. Pool towels provided very small, better to take your own. Around pool area extremely slippy, watch the kids, saw so many people go flying!! Also floor in restaurant very slippy too, dont wear heels! I have been to Iberostar before and have had a much better deal with the all inclusive I think this was probably the worst I have had but it is a Greek hotel and I have been in spain before so this may be the reason for my thoughts. However what I found was inexcusable was the quality of the wine it is on tap and is by far the worst red wine I have ever drunk even by Greek standards and they shouldn't say wine is included is terrible. The cocktails were mass made and not individually made and this showed they were weak tasting but a few were nice very limited choice. Also there was no waiter service and I have never boon to a 4 star even all inclusive that hasn't had bar waiter service this was really annoying. I found the buffet to be not very good quality and certainly not 4 star. If you chose well and stuck mainly to the whole fish and certain other dishes it wasn't so bad but it limited my choice to one or 2 items a day to eat. the rest was like work canteen food. the seafood pasta was really nice the rest was very watery. however, the comments in the book were complementary about he food. we booked for the Greek night and was supposed to pay 25 euro for the privalage but when we found out to get the cheapest bottle of wine we had to pay another 25 euros we walked out and got our money back. The location for us was excellent we payed extra and got one of the superior bungalows with seafront view form the kreta mare and the view was amazing. We couldn't use the main pool they played music constantly and the staff were the whole time asking if you wanted to join in with activities or they were organizing dances sport or just generally clowning around there there was a pool above the main pool but you were still disturbed by the music the other larger pool wasn't for us it was not too pleasant and it was a long way from our room. so we stayed by the fresh water pool which was smaller and had a nice view there was less people there. So it was very relaxing and we could sit on the terrace of our room and was relatively undisturbed with the views across the sea. The childrens club was very good an our daughter enjoyed it they put on a show with the children which is probably one of the best I have seen entertainers do. The shows were very poor and we just couldn't watch them. The bar area outside was nice to sit in in the evening and lookout to sea and at he sunset. The restaurant had loads of tables out side and we always got a seat mostly with the sea view so this for us was really good. If they could upgrade the restaurant and the bar and improve the quality of the drinks I would consider a return but not till then. The beaches of the hotel were not really pleasant to sit on and we went down swimming a couple of times but you couldn't relax. Anyone that knows me will know how hard I am to please when it comes to holidays! We found the Creta Panorma the best holiday we have had so far. Having checked reviews daily before I left I felt I had to give this resort the praise it deserves - in my opinion! We had upgraded to a superior bungalow which was actually a family room and they were on two levels. We were on the upper level. Our balcony faced directly out over the sea as did the rest. The view was absoultely stunning. You could watch the sun set every evening which was beautiful. Our room was cleaned daily and towels were also replaced daily. Upon arrival we has a bottle of wine and a basket of fruit waiting in our room, as well as a fully stocked fridge. This is free until you empty it obviously then it is not re-stocked. Both my son and husband had birthdays whilst there and upon return to the room on each day there was a bottle of cava and a birthday cake waiting - a very nice personal gesture. The buffet choice in the restaurant was amazing and we were never stuck with choice. Breakfast was cereal, loads of choice for cooked breakfast, fruit etc. Lunch was salad, pasta dishes, meat dishes. Dinner was the same but there were also meat and cheeses, a hot pasta section abd a carved meat section which they did there and then. The red wine and white wine and beer were really nice too. There was a selection of international drinks in the bars which were also very good and gave us no cause for complaint. Upon arrival at the hotel my husband thought we were very remote, but soon changed his mind once we were in a day or 2. The grounds were so big and there was so much to do that we enjoyed it very much. Usually I like to venture out at night and walk round the nearest town for a change, but did not really feel the need on this holiday. However, we travelled into Rethymon one night on the bus which took about 50 mins. We were not so keen on this town - like every other place - trying to get you into restaurants to eat, and it was very busy. Alot of the nicer shops were closed and it was all the usual souvenir shops that were open. We ventured into Panormo twice on the train from the hotel - it was lovely - very old fishing village. Not alot in it, but a couple of nice restaurants and bars. Very quiet but very picturesque. We loved it. The hotel staff were all so freindly and made your stay very pleasant. At the main pool, there was the usual music played - and the staff worked very hard every day trying to involve everyone. However, they were not pushy - if you did not want to take part they told you it was not a problem, just relax and enjoy your day. They did their best to involve the kids which was excellent (there were also several clubs for different age groups)as this went a long way to giving Mum and Dad peace to enjoy lounging at the pool! There was a problem with sunbeds being booked - but this was recitifed towards the end of our stay, as they put notices round all the parasols stating that beds should not be booked by leaving towels or anything else on them. There was still the odd exception but you get this everywhere. It was very warm but we found if you lay on the grassy area overlooking the sea you got a lovely breeze. The grounds were so huge and there were several pools so it wasn't difficult to find a peaceful spot if this is what you were after. There was entertainment most nights - but we only went a few times - only because this is not really our thing. The few times we did go the staff put 100% into everything they did and could not be faulted. It just seemed a bit sad to me that when it came to clapping that some people were maybe not so good at showing their appreciation which I felt was a bit of a let down. There were 17 different nationalities when we were there (this was discovered at one of the entertainment nights!) and Scots/English were in the minority. However my son met some freinds the first and second week which was great for us, as both families got peace while they did their own thing during the day! The one and only negative thing I could say about this hotel is that the main lobby is not as cool as I would have liked it. There was air conditioning but I felt it was no where near cold enough when you were sitting at night. I would thoroughly recommend this hotel to anyone - have already, and would have no hesitation in going back. We had a 3 hour delay before we reached our destination but found a comfy leather sofa in the bar at Birmingham airport and didn't let it set the tone for our much needed holiday. We arrived and were transferred by the erratic taxi driver to the hotel but the beautiful sunset, kept us relaxed and looking forward to what turned out to be a fantastic 2 weeks. Leave our bags which would be taken to our room, we popped up to the room minus the bags to get a quick once over and were very impressed, comfy clean & welcoming. We had upgraded for a sea view which we got, but on staying at the hotel for 2 weeks I could see that you would be hard pushed in any room to not get this anyway. Towels were changed every day, bedding at least 2x a week and more if required , just leave bedding/towels in bath and it will be replaced , rooms were cleaned everyday and toiletries replaced as required. I always take an iron with me & don't wash clothes until I return so did not test laundry facility. At The pool side you have a towel faculty, you get a ticket upon check in that you pay a deposit for, then you can collect beach towels for use by the pool that you can change for dry clean ones daily, or more if required, so no need for hanging towels of balconies, (although there are always some who will!!!!!!!!!!!! It is a rare sight at this hotel. Food was fab on all occasions, we used the restaurant for breakfast & evening meal, and tended to use the pool side bar for lunch, the quality was always 100% and we would definitely go back. Beer, wine and soft drinks are on tap so you help yourself, quality was fine. Although as always there are some connoisseurs who would disagree. May al inclusive is not for them! No queues ice cream was available by the poolside bar and again it was help yourself. There was food available pretty much 24/7. We only went to the scheduled entertainment a few times and it was enjoyable, although I have seen better with First Choice reps. Although it certainly wasn't for the lack of trying on the entertainment teams behalf. Rocky was an absolute star with the children. They must have work 24/7 as they are always around and always smiling. There is entertainment throughout the day with pool aerobics salsa dancing archery and the rest if you want to par take, ---- I don't I like to laze about and people watch and soak up some rays. The main pool can be very entertaining but there are plenty of smaller pools if you like somewhere quiet, even a baby splash pool for the little ones that is nice for some quiet 1-2-1. There is also a toddler safe area included within the main pool. We went in May so the swim up pool wasn't open, it didn't spoil our holiday, and you can use the sister hotel adjoining where their swim up pool was open, we didn't use it so not sure what was available as all inclusive there, there was such a lot of locations within this site we never felt the need to peruse it, although our son used the indoor pool at the sister hotel a few times as he said it was warmer , I dipped my foot to check & couldn't feel any difference!!!!!!!!!! b) It may not be up to your standard. (I enjoy blossom hill so it's fine for me) you may have to pay for a better quality of wine I didn't feel he need. Many people moaned about the cost, as we were all inclusive but a it was worth every penny the food was amazing, entertainment fantastic, and then finished off with a spectacular fire work display that (those who had moaned about the cost) sat like the poor relations on the steps to watch!!!!!!!!!!!!!!! The bar staff were amazing after serving you once, you could approach the bar as a regular and they would know what your tipple was. We went with our 9year old son, he very quickly made friends and only occasionally used the kids facilities, which again I would say I have seen better in First Choice resorts but the facilities (i.e.) pools and the location make it difficult to not enjoy anyway. Our son has always used the kids clubs but, as he is now a little older favoured staying by the pool and just attended a few activities. We arrived at Heraklion Airport in the unearthly hours of the morning and it was complete bedlam. Bearing in mind this was in September, so I can only imagine what it must be like in full season. About 3 or 4 flights arrived within about 10 minutes, and the airport just could not cope. It was full, there were no announcements and we waited for about an hour just for our bags to be unloaded. There were not enough trolleys or toilets. Returning home was even more of a nightmare. Once you got through security into the departure lounge you could not move for people. At one stage we would not even turn around it that was packed. It was rather scary for about 10 minutes and it was swelteringly hot. The problem was nobody was boarding flights so people were coming though into the departure hall and there was not enough room. There are several swimming pools all of them apart from one are salt water. There are fresh water showers so you can shower after your swim. Food was great. Breakfasts served from 5 AM, and there was continental, English fry up, cereals, yoghurt, fresh fruit, cereals. Lunch could be taken in either the main restaurant (have to wear a top and shorts and be dry) or the pool bar (had to wear a top but could wear your swimming costume too). Again salad, bread, chips, meat and fish and fresh fruit. Afternoon cakes and then evening meal from 6.30 PM. The choices were vast. It was all buffet help yourself and you could choose Soup, salad. There were about 5 different pasta choices, several meat and fish choices with fresh veg and different potatoes, vegetarian choices, huge salad bar, bread etc. Fresh fruit and a huge sweet trolley. There is unlimited soft drinks, beer red and white wine which is help your self taps around the bars and restaurants. The area around the Pools is very slippy, so do be careful. We have recently returned from our two week holiday at Creta Panorama and I would Highly recommend this hotel. The hotel was spotlessly clean and the staff were brilliant. The kids club was great, made them all welcome, my 6 year old daughter really enjoyed it. The animation team were excellent, with different things going on all day, darts, shooting, boules, archery etc. They also provided the evening entertainment in the outdoor ampitheatre which was good. The beach party and greek night were good but there is a charge for this, but well worth it. Costas, the assistant manager, was constantly checking the hotel to ensure that everything was in order. The food was very good, with a good selection. There was a children's buffet, pizza & pasta area and show cooking. You can book into Zorbas for a candlelight evening meal, which made a nice change. The beer, wine and soft drinks were all on help yourself taps, so no need to wait at the bar! Booked to return August next year. Can't wait. The Creta Panormo was our first stay in an Iberostar Hotel after spending many holidays in the Barcelo and Riu chains, and we were not disappointed. The Panormo is a very good hotel set in breathtaking surroundings. The hotel and rooms were scrupulously clean, the staff very polite and extremely friendly. 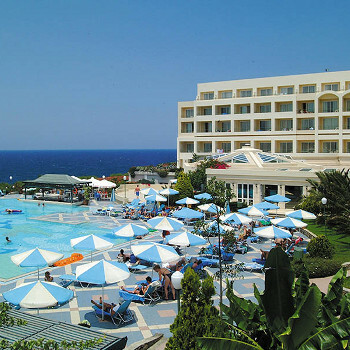 The hotel shares it's location and facilities with the Creta Marine, which is also an Iberostar. On arrival, the reception is very spacious with plenty of comfy seating. While checking in, the porter took our cases to the room and had left before we arrived (no hanging around waiting for a tip although we found him later and tipped him then). The room was lovely with a sea view (I think all rooms overlook the sea from one angle or another). Away from the main hotel are a large number of extremely attractive villas, all with fridge and cooking facilities which I assume are for self catering (but could be wrong). The villas are all very well maintained and a good number look brand new. I got the idea that the hotel opens a little earlier than these as they did not appear to become occupied until during our second week. Food - The buffet-style food was laid out in huge quantities and should cater for all tastes (although one entry in the comments book did ask for more British food, maybe toad in the hole ?? - an inappropriate comment as there is plenty to suit the British palate). Our only minor gripe - hot plates were not readily available unless you searched for them and the hot food itself could have been warmer, but then again, I like mine HOT. Although the dining room is no smoking apart from one area, occasionally people ignored the signs in the no smoking area and were not challenged by the staff. Daytime snacks available and beer and wine are on help-yourself taps. Entertainment - pretty varied in the day-time and the team were very friendly without being pushy. As we went very early in the season, the evening entertainment had not completely kicked-off although this did not concern us as we always holiday with friends and prefer to relax over a quiet drink in the evenings. Those we spoke to who went to see the shows which were put on all had good comments and there is a separate disco for the younger ones. Pools - there are about 6 or 7 pools spead out between the two hotels (I lost count). The main pool at the Panormo was outside the hotel building with another on a raised terrace. These are both salt water. However, a third pool at the far (west)end of the complex is fresh water and we found this on our 3rd day. Although it has it's own bar, this was closed, again probably due to it being early in the season, but we brought drinks and food from the main pool bar which was only 200 yards away. Anyway, this must have put some people off, which worked to our benefit as we had sole use of our own pool for 9 full days. We even got to the point where we felt as though we were being intruded upon when anyone came by during this time. Inevitably, it attracted a few more people over the last few days of our stay. Finally, back to the hotel grounds. Absolutely stunning !! I have stayed in some very nice locations when on holiday but this was beautiful. The grounds are so well kept, clean and tidy. Numerous little paths wind around the complex so walking is really enjoyable, and there is an abundance of foliage and colour. As well as from the pool areas, sunbeds are also laid out on the grass and were plentiful. You didn't need to stake your claim with a towel although what it would be like when the hotel is full, I'm not sure(pool towels were provided by the hotel, by the way). The coastline is quite rocky with a shingle beach just past the west end of the complex. However, three man-made lagoon-shaped breakwaters have been built along the hotels private stretch of the coast providing safe contained areas for children to swim in. All in all, a very pleasant holiday and somewhere we would return to in the future - highly recommended.